If you have spent time around or consider yourself a millennial or “gen Z-er,” you most likely have heard of the Enneagram or been asked “what number are you? !” as an exuberant individual looks at you with anticipation. This personality test has become the topic of numerous conversations and digs deep into human behaviors, allowing for an understanding of ourselves and others. I was first introduced to the enneagram at Trinity Christian College, and now have made my family and other friends take the test to see which number they are. Ryan O’Neal, who goes by the name of Sleeping at Last when producing music, has undertaken a project of writing songs about each of the nine enneagram types. This past Friday, his song and podcast about type sevens were released, and as a seven myself (the Enthusiast), I was ecstatic about this content. If any of you know me, it is quite obvious that I embody both the positive and negative aspects of being a seven, and for this blog post, I decided it be important for me to acknowledge how life as a seven has impacted my time in the city of Chicago. To give you a short explanation about those of us who are considered to be type sevens, we are enthused about EVERYTHING. We are extroverted and optimistic, but also impulsive and impatient (yes mom, I’m working on my patience…). We always want to be happy, and avoid pain as much as possible. FOMO is a daily struggle. There is a new plan for our future every couple of days, and being by ourselves is unheard of. These are just a few of the traits that are true for me and other sevens (shout-out whoop). Reflecting on how existing as a seven has impacted my time in the city, I first thought of my internship. I am interning as a social work student at North Side Housing and Supportive Services, an organization that connects homeless individuals with housing and other resources around the city. Type sevens tend to make fantastic humanitarians because they can get close to pain (that is not their own) and are fast thinkers who come up with solutions. I have begun to perform intakes with participants, meaning I sit down for the first time with someone who is houseless and in need of help. Last week, I was able to discuss with an upper-twenties individual who had never admitted to anyone that he was experiencing homelessness, and continued with his classes in college, but had no way to support himself financially or physically. Together, we came up with solutions and found resources to aid him, encouragement following him as he left. Although this intake was positive, I have also had intakes where individuals are dealing with toughness that is unimaginable. Social workers are always told that there is burnout because it is difficult to hear these stories and not take them home with us. Because I am a seven and am terrified of being trapped in pain, I attempt to fill my time with activities that draw away from the reality of the participant’s hurt, striving to only see the positive. In supervision, I am learning how to be honest about how the tough intakes impact me, and am looking to continue growing in painful empathy. In the Arts and the City class that other Chicago Semester students and I are in, we have the opportunity to attend plays, dance performances, operas, and visit art museums around the city. The song “Atlas: Seven” by Sleeping at Last sings, “How nice it’d be if we could try everything, I’m serious, let’s make a list and just begin”. 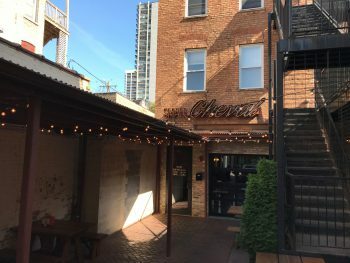 I have a taste of trying everything as the experiences we are given allow us to encounter various parts of the city and meet numerous individuals that are diverse in background. 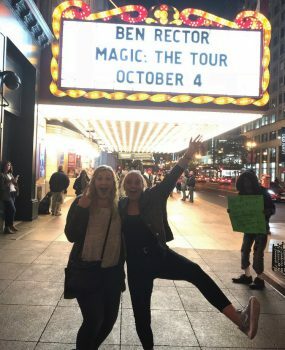 Allison and her friend at a concert at the Chicago Theater! As impatience can control the lives of a seven, late trains and buses peeve me to no end. There have been numerous times where the transit app will tell me it takes 22 minutes to get to church, when in fact the bus is running late, and my friends and I have to book it 8 blocks to make it in time to sing “What a Beautiful Name.” As I acknowledge this impatience, I am striving to be present in every situation. Conversations with a visiting social worker from New York at the bus stop or a struggling mother of five waiting for the red line have made profound impacts in my time here in Chicago. Finding opportunities to experience life in the moment can be difficult for sevens, but the unpredictable timing of transit provides opportunities I would not otherwise have. Because this my last semester of undergrad, the seven in me is continuously looking towards future plans. Sevens imaginatively anticipate their future, and with an awkward eight months between graduation and graduate school, thoughts of this upcoming time creep up, distancing me from the present. Thankfully, I have made fantastic friends through Chicago Semester that encourage my enthusiasm, us snatching up opportunities to explore neighborhoods, attend churches around the city, and simply laugh at life. “But I want to be here, truly. be. here,” are more lyrics from the song “Seven” and these friends (none of them sevens-they keep me grounded and remind me everything in life does not have to be approached with a smile) have kept me from the constant planning of my future, and I am thankful that they are encouraging me to experience this city fully. Thinking about how other sevens and I can better be with Christ, the verse from Psalm 46:10 came to mind. It reads, “Be still and know that I am God.” The slow life has never been something I have embodied (hence why I love the fast-pace the city of Chicago offers), but in my quest to embody a “healthy seven,” finding rest in quiet places such as the trail along Lake Michigan or the numerous coffee shops around allow me to spend time in His presence.